Jacqueline Dawes operated Brookhaven Retreat about 15 years in Blount County. She suddenly closed the high-dollar, private center for women March 5, leaving employees without pay and clients without treatment. 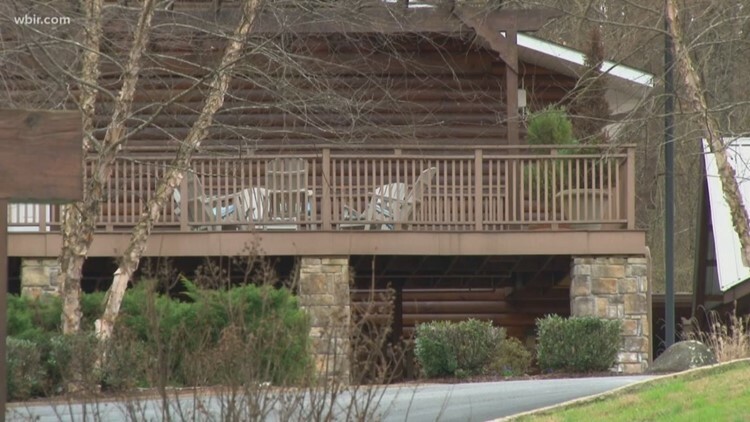 KNOXVILLE, Tenn. — The IRS has slapped tax liens on a defunct Seymour women's treatment center and on the million-dollar Knox County home of its operator, alleging she owes $4.2 million in unpaid income taxes. 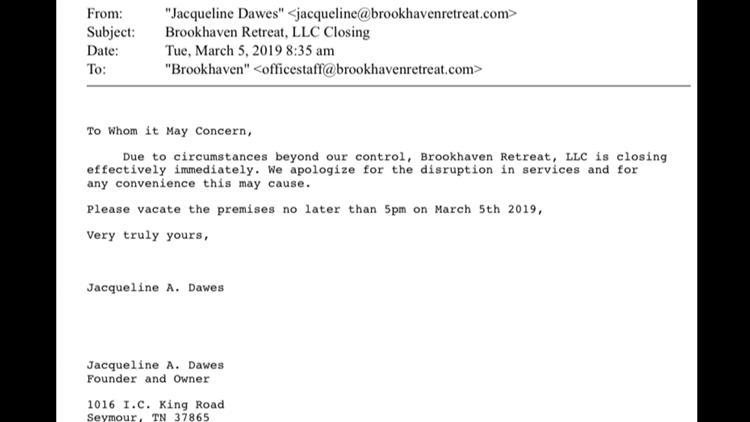 Federal tax authorities filed the liens March 8, three days after owner Jacqueline Dawes abruptly closed Brookhaven Retreat off I.C. King Road, records show. The liens serve as a legal claim on the property. The claims cover $2.6 million in unpaid taxes for Dawes for 2015 and $1.66 million for unpaid taxes for Dawes in 2016, according to documents. Records also show Pinnacle Bank, which holds a $7 million mortgage on the Brookhaven Retreat property that dates to 2013, has taken steps that could lead to foreclosure. "I wish I could say I was surprised," said Knoxville attorney Charmaine Nichols, who won a judgment last year against Dawes and Brookhaven for a Florida man whose daughter had been a client. "I was extremely disappointed. But what has really shocked me is the number of people that have reached out to me since then." A bank spokesman issued a statement to 10News. "We respect our clients’ privacy and therefore cannot comment publicly on individual financial details. But speaking generally, we work closely with clients who are in tough financial circumstances to find a solution that can improve their standing and, when possible, keep the doors of their business open. That is often in the best interest of the owners, the people they serve and the bank. We were not involved in the decision to close Brookhaven," the statement from Pinnacle reads. Efforts to each Dawes, a native of the United Kingdom, have been unsuccessful. The IRS has filed liens against property owned or controlled by Jacqueline Dawes in Blount and Knox counties. On the morning of March 5, Dawes sent employees a message informing them they'd be closing Brookhaven by the end of the day. The center on 40-some acres catered to a wealthy clientele, offering residential mental health and substance abuse treatment at about $50,000 a month. 10News has been investigating Dawes and the center since she closed it. Dozens of staff members including nurses and support personnel left the center without several weeks' pay. Dawes gave away two horses the center had been using for equine therapy. RELATED: Pricey private treatment center for women abruptly closes in Blount Co.
Former employees tell 10News they'd been notified on March 1, which was supposed to be a payday, that payroll would be delayed because they were being acquired. They now suspect that was merely a lie to placate them. About five clients, who already had paid in advance for therapy, had to leave Brookhaven in the midst of treatment this month. Staff scrambled to arrange transportation so they could go home, mostly out of state. Families of some of the clients tell 10News Dawes had insisted they pay in advance for treatment, and she typically pushed for a client to get three months of therapy -- costing about $150,000 in all. Some families now say they're still due $50,000 or $100,000 for interrupted treatment. It may be tough to collect money now, Nichols observed. "I don’t think anything is impossible," she said. "But it’s certainly not encouraging, because I think that everybody else knows that an IRS lien will trump, it will supersede any other type of lien." Court records and clients show Dawes had faced numerous complaints in recent years for failing to reimburse clients and for federal labor law violations involving some sales staff. Along with the Brookhaven property, the IRS has filed a lien on Dawes' mansion on Parsonage Lane near Gov. John Sevier Highway in Knox County. She offered it for sale last year for more than $5 million. She took if off the market but then put it back up for sale. Situated on 18 acres, the home dubbed Bellamont is now being offered for $8.4 million. 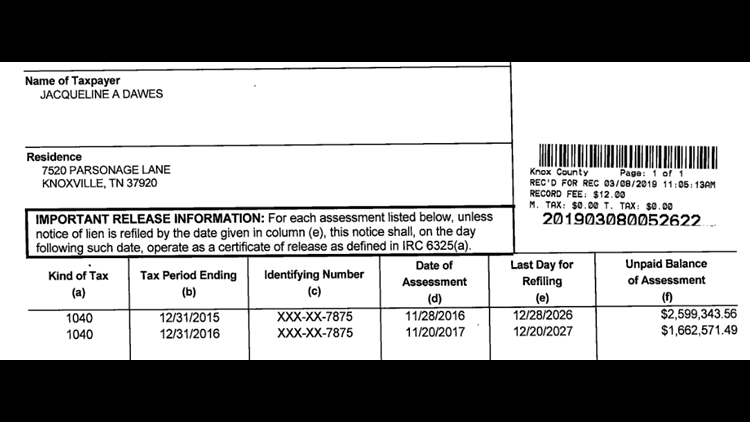 Knox County records show Dawes previously faced a $150,000 lien for work on the property in 2016. That's since been paid. "Who is going to buy a place with a $4 million dollar lien against it?" Nichols mused Thursday. On March 8, Pinnacle Bank moved in Blount County to appoint a successor trustee on the Brookhaven property. That's typically a sign the property is going to face foreclosure. Walter Winchester is identified as the new trustee. He did not respond Thursday to a request for comment. 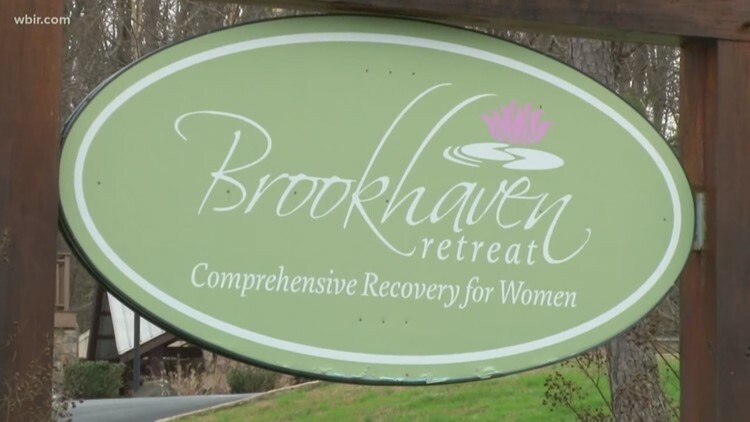 Brookhaven operator Jacqueline Dawes sent out word Tuesday that the private Blount County treatment center would be closing at the end of the day. Dawes holds no medical licensure or certification for mental health or substance abuse treatment. She told clients and prospective clients she was moved to open the center because of the death in Scotland of her young daughter from a drug overdose in the late 1990s. Dawes and her husband moved to Florida a few years later. By 2005, Dawes was in East Tennessee, records show.